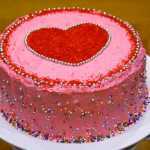 Here is a collection of baking and cooking recipes using food-coloring as one of the ingredients. This page will be updated on regular basis. 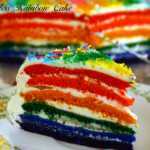 Very easy to bake and make egg free rainbow cake to brighten up any special occasion. 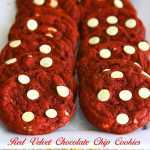 I can assure you that this is the best red velvet chocolate chip cookies recipe. Simple ingredients, easy instructions, yields these gorgeous looking cookies. Want to bake a novelty cake for a special occasion? Don't have much time? You are not artsy enough to bake/decorate something beautiful? No worries. Try this egg free checkerboard cake recipe and wow your guests! 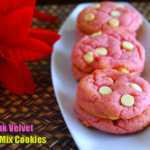 Bake the most beautiful looking and sumptuous pink velvet chocolate chip cookies using white cake mix. Baking Cake-Mix cookies can't get any easier! 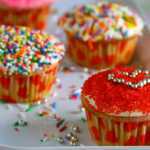 The Easiest Christmas Cupcakes Ever! Two Ingredients Christmas Cupcakes! You heard it right. 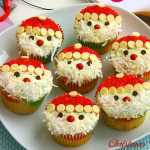 It's Christmastime and what better time than now to make these cute Santa Claus cupcakes! Valentine's Day or a baby shower these cute looking pink velvet cupcakes will surely be the talk of the party. Valentine's Day Crinkle Cookies: Not a baking pro? Want to bake cookies like a pro? Cake mix is your solution! 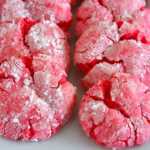 Bake these cute little pink crinkle cookies using cake mix and make your Valentine's Day even special.